With so many providers in the VPN industry, it can be difficult to stand out from the competition, but E-VPN is determined to get ahead of the game. Although it is a small company, E-VPN strives to provide a solid service with top features that protects users’ data with strong security. E-VPN covers all the aspects that are important when it comes to a VPN service. It works with multiple platforms, offers fast speeds and it has a variety of servers around the world that allow you to overcome censorship and geo-restrictions. E-VPN promises to help you to keep your online traffic private and secure, but is it really a solution that you can trust? We’ll find out in this review. E-VPN uses OpenVPN only, and while this comes with some limitations, the fact is that OpenVPN is the most secure protocol so it is a good thing that E-VPN supports it, even if there are not other options available. E-VPN directs the data via OpenVPN TCP 443 and UDP 443, which gives you good speeds and flexibility. The data is encrypted with 256-bit key, giving a high level of protection to keep eavesdroppers, hackers and other threats at bay. E-VPN states that no logs are kept of your online activities and it doesn’t keep track of the IP addresses used, or other details that could be traced back to you and help others to identify you. However, it should be mentioned that the provider is based in the United Kingdom, the home of one of the main enemies to privacy, the GCHQ. This can cause concerns for many users who value their information and don’t want to be the target of surveillance programs. That being said, since there are no logs kept at all, even if contacted by third-parties or government organizations, there is no significant data that E-VPN could hand over to them. E-VPN has dedicated software for leading platforms like Linux, Mac, Windows and Android. This means that you can easily set up the VPN on devices running these operating systems. Unfortunately, at the moment, there is no app for iOS, but we hope that this is launched in the near future to make things easier for iPhone and iPad users. The clients that are currently available are convenient and straightforward, but the interface needs some upgrade to ensure that it offers smooth performance. Overall, you can access all the functions available without hassle, but the design could be revamped to offer an even better user experience. 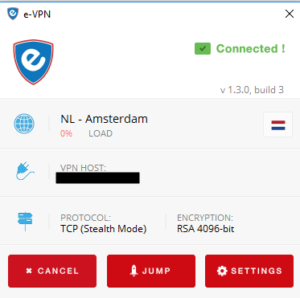 In addition to the apps, E-VPN offers manual configuration guides and APK files that allow you to set the VPN up using OpenVPN and sideloading it to your device. You only need a username and password to register on the website. Once you create an account, you have the option to start with a free trial that allows you to use the service for 24 hours without charge. Once you receive a confirmation email, you can download and install the client on your device. 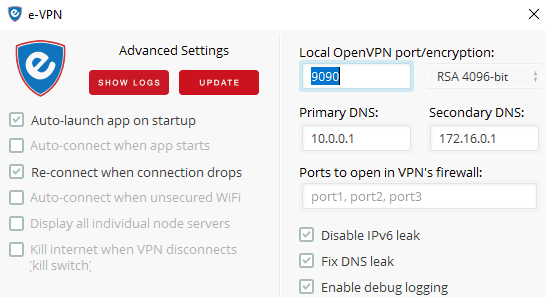 After logging in to your account, you have the chance to select between OpenVPN TCP and OpenVPN UDP. You will also be able to choose the VPN server you want to connect to. E-VPN has servers in 8 different countries around the world, including Australia, United States, Singapore and different countries in Europe. This means that while the number of locations is limited when compared to what other providers offer, the servers are distributed in a way that ensures that customers have good options available. No bandwidth restrictions are applied and you can change servers whenever you want to. E-VPN applies IPv6 and DNS leak protection to add security to your connection. Since P2P is allowed and the service offers good speeds, you can use E-VPN to download torrents securely. You can have 2 simultaneous connections, which means that you can protect your computer and your mobile device at the same time. NAT Firewall is another feature that E-VPN supports and it gives you flexibility and an added layer of protection. Additional notable features include a bypass for DPI – Deep Packet Inspection firewalls built-in to the client, and Netflix unblocking for quick one step streaming. There used to be 3 plans available but E-VPN has made things much simpler and gave away with the traditional monthly, bi-yearly and yearly plans. Instead, you can choose to purchase the service for all server locations and features, such as Netflix unblocker for a full year at the cost of only £15. That translates to roughly $17 US dollars for a whole year of service which includes up to 2 devices per account. Very affordable and efficient. To add to this great offer, E-VPN also offers a free version that is limited to US, UK and Singapore servers and basic browsing needs. E-VPN offers online assistance, which allows you to get fast responses to your queries. You can contact them via email as well, but if you need quick help, the online chat is the most effective option. The responses are not only fast, but also professional and detailed. There are also practical guides that will allow you to set up the service manually. E-VPN hasn’t achieved the level of popularity that other providers have, but it is a solution that offers high security, convenient pricing and all the features that will allow you to enjoy online freedom and security. They don’t keep logs of your activities, or of any other aspects of your connection that could compromise your identity or privacy. The speeds of the service are decent and allow you to stream or download content. While there is room for improvement and there are not as many servers or features as other popular services provide, E-VPN aims to stand apart by offering a simple, solution with a strong focus on privacy.